It seemed fitting that my first food/review blog post of 2019 would be about a cute cafe I had been meaning to try all of 2018 but never got a chance to. 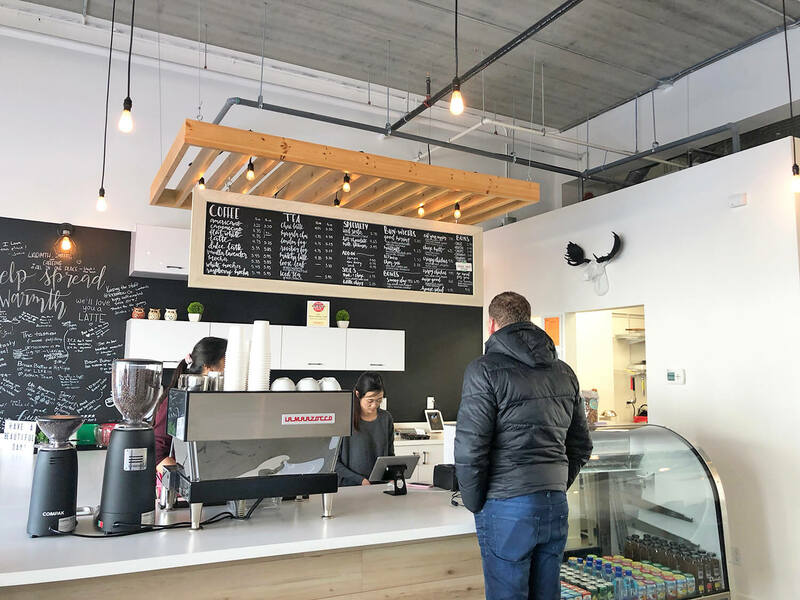 The Brown Butter Cafe is a cute little cafe located in south Edmonton at 1528 91 Street (and certainly the cutest little cafe that deep south of the city). 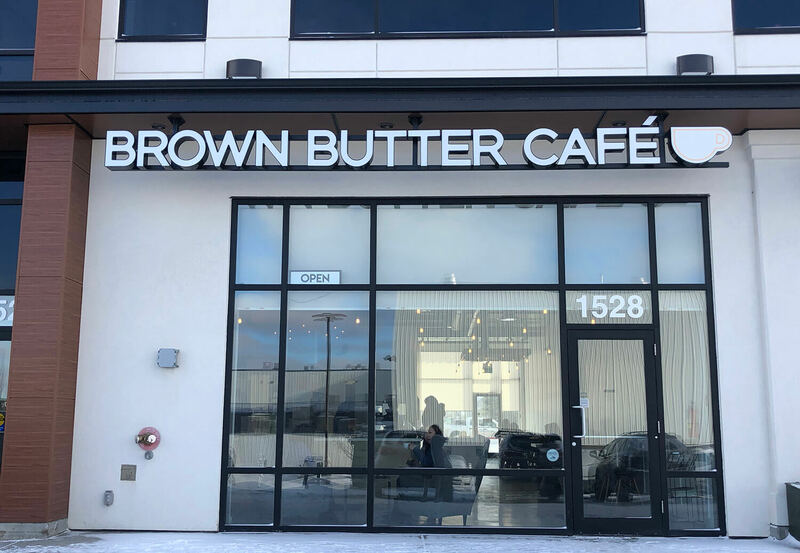 The Brown Butter Cafe is located in south Edmonton at 1528 91 Street. 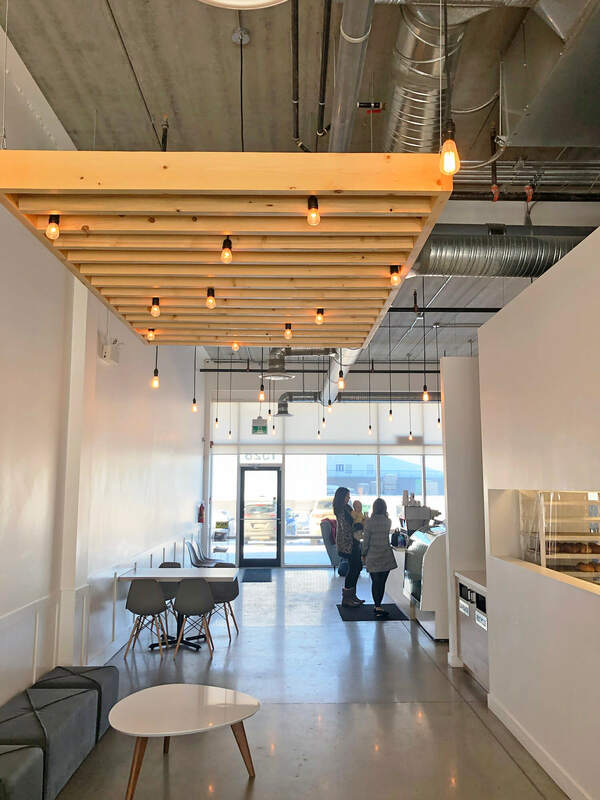 Inside the Brown Butter Cafe you’ll find a mostly white, minimalist interior. There are some hanging light bulbs and a chalk board menu, with a window to peer into the kitchen. More lights hanging from wooden pallets in the ceiling. And small white and wooden tables with those popular, modern chairs with wooden legs you’re seeing in a lot of places now. The main counter at the Brown Butter Cafe. 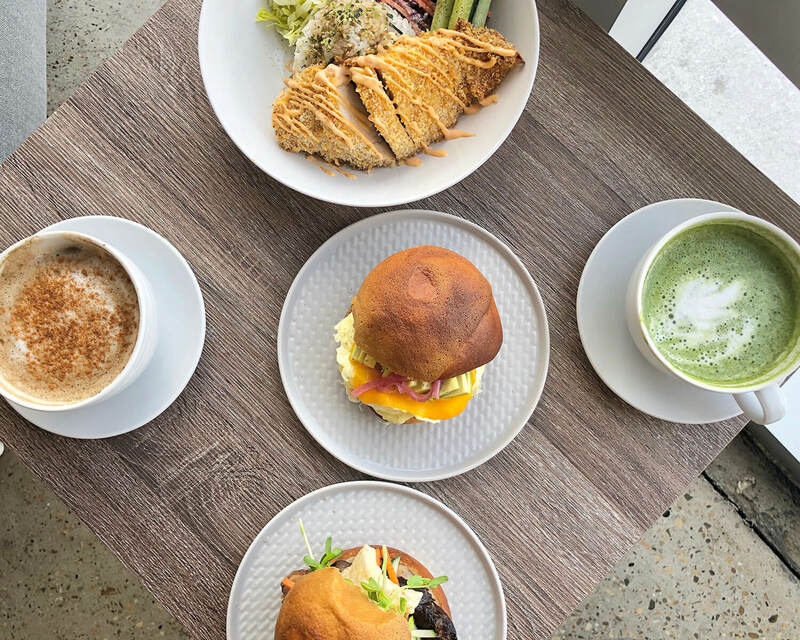 Owned and operated by the sweetest couple Heena and Michael Mak, the Brown Butter Cafe opened in late 2017, offering a small menu of coffees, teas, specialty sodas, bunwiches and bowls at really affordable (cheap!!!) prices. 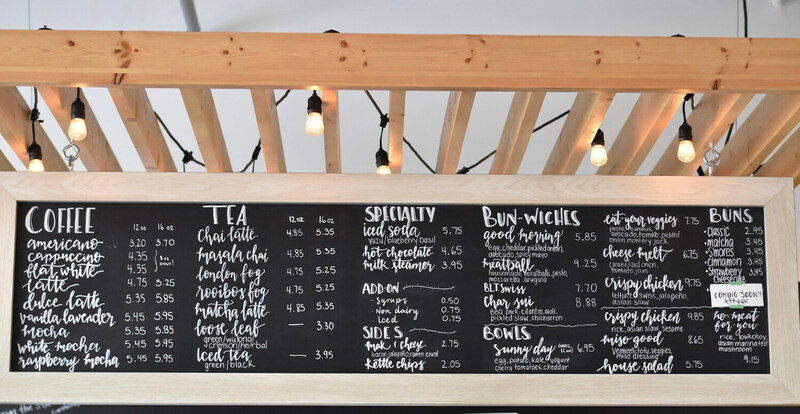 The chalkboard menu at the Brown Butter Cafe featuring affordable coffees, teas, bunwiches and bowls. Heena and Michael were NAIT Culinary students when I was working at NAIT, so I had been following them on social media for a few years, and was excited to see not only their relationship grow but also their professional careers too—from working at different restaurants around the city to now opening up their own cafe. That’s part of the reason I had wanted to come try the cafe for so long and why I was so excited to finally make it there! The reason it took me so long to come try is because Brown Butter Cafe’s hours aren’t the best if you’re not living or working in the area—they’re open Monday to Friday only, from 8 a.m. to 5 p.m. No weekends. No chance for a visit if you work typical job hours, at least for now. They’ve said once their son gets a little older they would look at potentially extending hours of operation. Fingers crossed! But also, really cool that they made their decision about hours based on ensuring time spent with their boy. When my friend Veronica and I got to the Brown Butter Cafe just after 12:30 p.m. on a Wednesday in January, the place was full (which was awesome to see)! There were friends meeting for lunch, people on their laptops working, some people coming in just to grab a coffee to go—a really lovely cafe vibe. There aren’t a whole lot of seats in the cafe especially during peak hours, so that’s something to note (maybe go in between breakfast and lunch, or after lunch if you’re headed there). We waited maybe 10 minutes for a table to free up, and in the meantime chatted with Heena about her recommendations on what we should try. 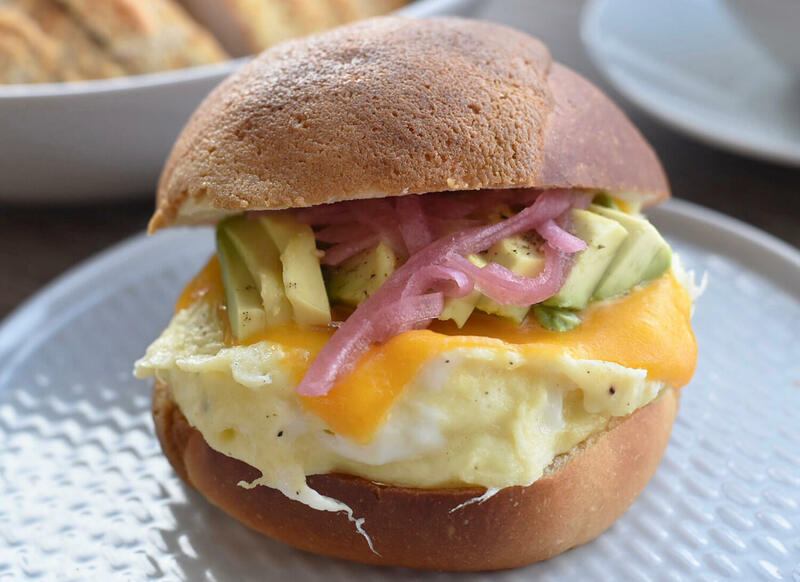 The Brown Butter Cafe’s signature dish: the Good Morning bunwich with egg, avocado, pickled onions and spicy mayo on a housemade bun ($5.85). The bunwich is really what the Brown Butter Cafe has become known for. These buns are made in-house, and there are savoury and sweet options (though the bun itself has a sweeter taste). If you go for their sweet, dessert buns you’re looking at spending $2.95 up to $3.45 per bun, with flavours ranging from matcha to S’mores, cinnamon and strawberry cheesecake, or just a classic bun. 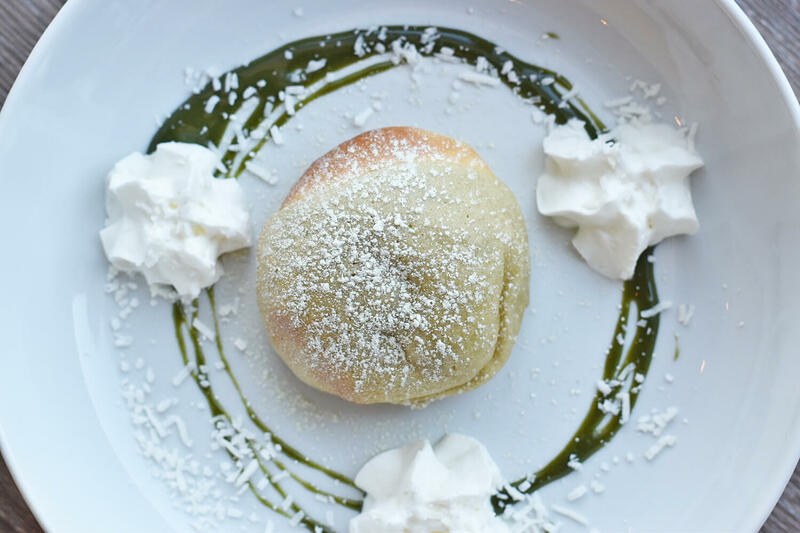 The matcha green latte dessert bun ($3.45) at the Brown Butter Cafe. If you go for their savoury buns, you’re getting them in the form of bunwiches, basically sandwiches but with buns instead of bread. These range from vegetable or cheese-filled buns to char siu BBQ pork, crispy chicken or meatball-filled buns. Buns range from $5.85 up to $9.75. The most delicious crispy chicken bowl at the Brown Butter Cafe on rice with Asian slaw and sesame ($9.85). The most expensive item on the menu costs just $9.85—that’s the Crispy Chicken Bowl with rice, Asian slaw and sesame. 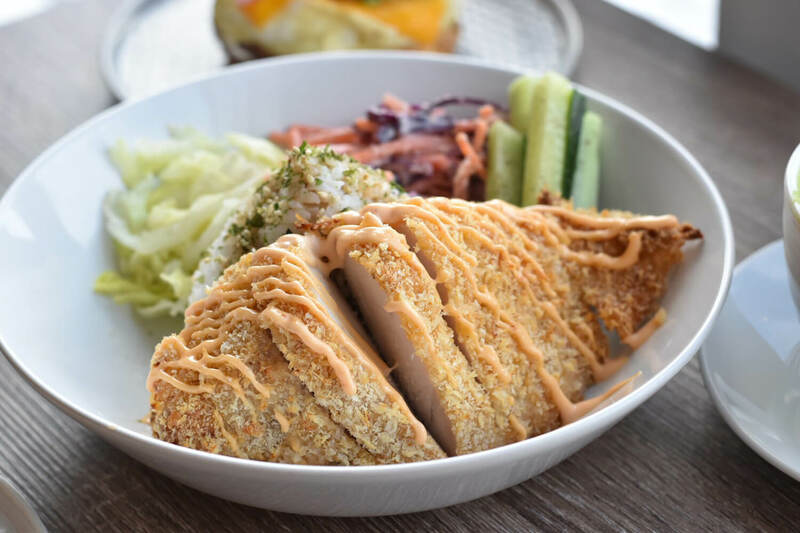 Heena says the Crispy Chicken Bowl is one of their most popular for lunches, while their Good Morning bunwich is most popular for breakfast (but also the signature dish of the cafe). The Char Siu BBQ Pork bunwich at the Brown Butter Cafe includes chicharron (pork rind), cilantro aioli and a pickled slaw ($8.88). We also added an order of the char siu BBQ pork bunwich ($8.88), and I got their matcha green tea latte (12 oz. for $4.85) while Veronica ordered the chai latte (also a 12 oz for $4.85). They’ve got some really nice drink selections here, including something called a Dulce Latte (I imagine it to be sweet and delicious, like dipping your mouth into dulce de leche sauce lol). And there’s a deliicous specialty Yuzu iced soda ($5.75), which I tried to go. Yuzu is a sour Asian citrus fruit that sort of looks like a lemon, that’s sort of grape fruity in flavour. 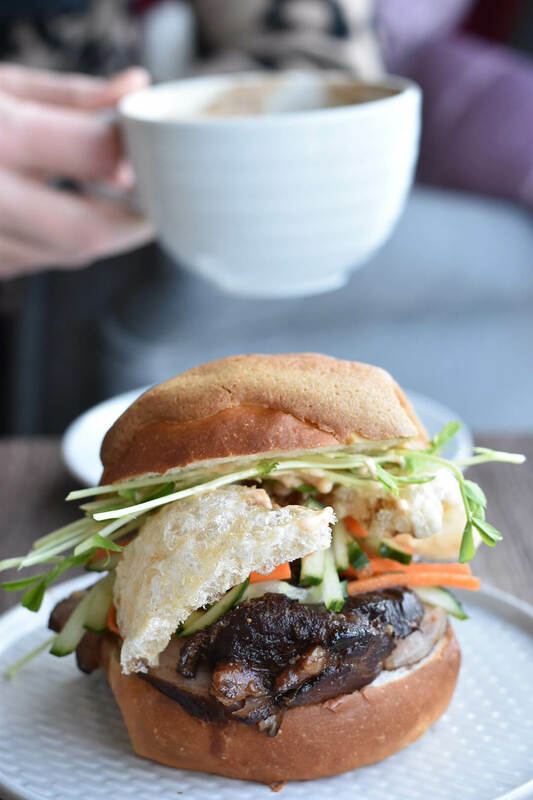 It’s one of the lovely Asian ingredients that can be found throughout Brown Butter Cafe’s menu (Heena is Korean and Michael is Chinese)—from the matcha latte and bun to the yuzu soda, char siu bunwich or asian bok choy and Asian style marinated mushroom bowl. 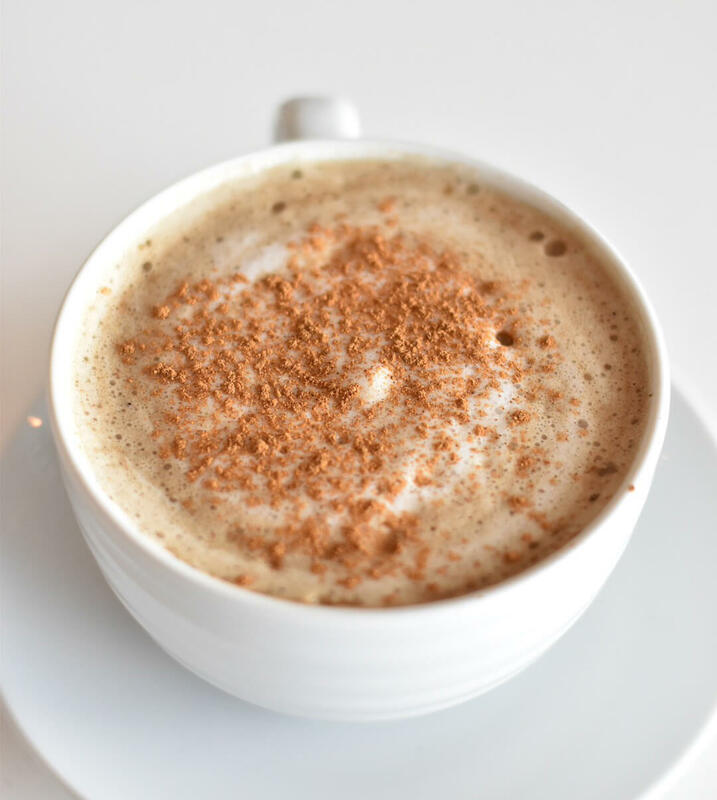 A very creamy chai latte at The Brown Butter Cafe (12 oz for $4.85). Talking flavours: The bun here is slightly sweeter, so in a bunwich, combining the sweet with the savoury filling makes for a really nice bite. The Good Morning bunwich ($5.85) in particular, features fluffy eggs, a nice sharp taste coming from the pickled onions, a bit of a kick with the spicy mayo, and then some creaminess from the avocados. I can guarantee you’ll gobble that bunwich up in just a few bites it’s so good you won’t be able to stop yourself, and I challenge you to find another place in Edmonton (or… anywhere?) that offers an avocado breakfast item for under $6 lol. The breading on the chicken in the crispy chicken bowl is perfect. The rice is well-cooked. The sesame and slaw work great together. The char siu BBQ pork is delicious. The matcha latte isn’t overly bitter and Veronica said her chai was the best (and creamiest) chai latte she’s had (and she’s had a lot of chai lattes). At the end of our totally satisfying meal, Heena gifted us a matcha dessert bun to try ($3.45). Another beautifully presented, delicious and affordable dish. Our delicious spread at the Brown Butter Cafe. We were so thrilled with the quality, presentation and flavour of the food and drinks we tried at the Brown Butter Cafe! All of that, along with the lovely service and how low-cost everything is makes a visit to this cafe seriously a win, win, win, win, win. 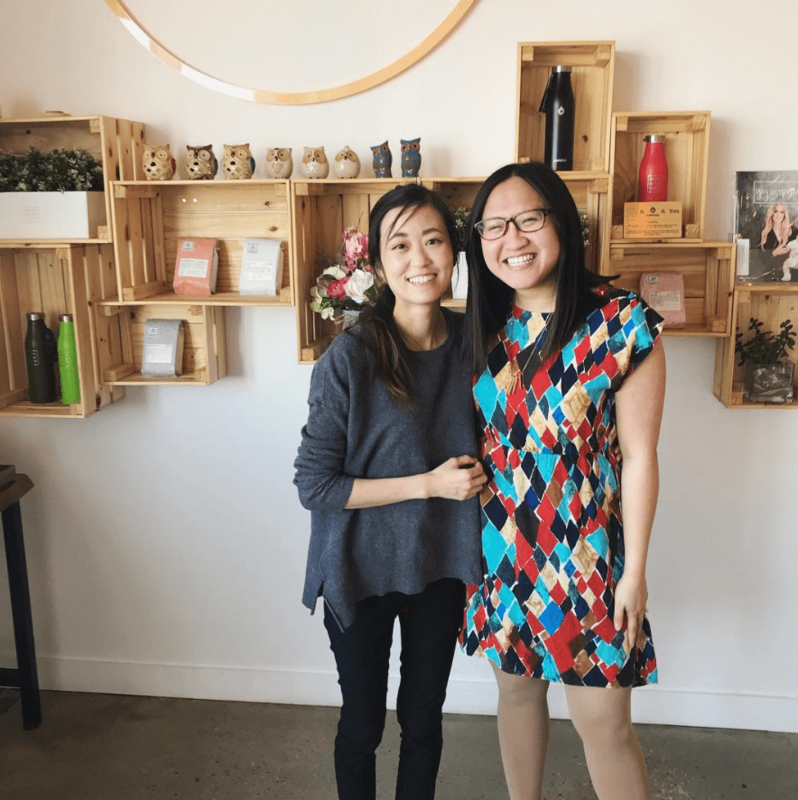 As my regular readers will know, I also love a place with good lighting and as you can see from the photos in this post, the Brown Butter Cafe is one of those places! Light, bright, with lots of sun coming in from the windows, there is no issue taking a cute photo of your food or drinks at this cafe. Veronica and I spent two hours eating, drinking and catching up at this cafe. We probably could have stayed even longer it was so cozy and comfortable. I can’t wait to come back and I’m telling everyone I know that they’ve got to make it down to try it if they get a chance (given the more challenging hours if you’re not in the neighbourhood). If you are in the neighbourhood, I’m super jealous. I’ve never been someone who stops to grab a coffee or breakfast sandwich on the way to work, but if I lived or worked near Brown Butter Cafe, I’d be stopping here every day. A view of Brown Butter Cafe from the back looking forward. My main advice for your visit is a reminder that during peak hours (breakfast and lunch) you might find it hard to get a seat. Be prepared to order your items to go, wait a little bit, or choose to go in between peak hours. My other advice: share food with a friend! I was happy Veronica and I got to share a few different items because I couldn’t decide between a bunwich or a bowl. DO BOTH IF YOU CAN! They’re both amazing. Parking here is free and ample, so you don’t have to worry about that! But do put the address into Maps because it’s not the most visible cafe from the main road. So lovely to finally meet Heena and Michael, owners/chefs of the Brown Butter Cafe! Just the loveliest little cafe with the sweetest owners! Finally, where I see areas of improvement, which I’ve mentioned already: They could add a few more tables so more people can enjoy them at a time, and it’ll be amazing when they can extend their hours a bit (also so more people can enjoy them!) Other then that, there is really almost nothing to fault here. I’m obsessed with how cute, cheap, and delicious the Brown Butter Cafe is. My congratulations is over a year late but truly, congratulations to Heena and Michael on creating such a lovely little space that’s clearly been greeted with open arms in the community. I love your menu. I love your food. You are both so sweet, so humble and kind (as are your staff!) And those qualities seep out when you take an order and make an order. I can’t wait to come back to try more dishes at the Brown Butter Cafe!